Desktop management at any scale is a tedious job. Imaging, reimaging, and troubleshooting desktop systems consume valuable IT resources, and keep employees from being productive. Securing the information generated on desktops, tablets,and smartphones is no simple job either. For these reasons, many IT organizations are deploying virtual desktop infrastructure (VDI). With VDI, desktops are virtualized and reside on the server in a datacenter. Endusers aren’t dependent on a single physical device at the office, and can access their centralized desktop image via a multitude of devices, making them more productive. With desktops now stored in the data center, businesses are protected from espionage via lost or stolen devices. While managed by hypervisors on servers, the actual desktops and user data are stored on shared storage systems that require both consistent and peak performance to deliver positive end-user experience. It is generally acknowledged that flash storage is the best storage medium to address VDI requirements, due to its low latency/high IOPS characteristics. All-flash arrays and hybrid arrays are two key solutions considered for VDI shared storage. 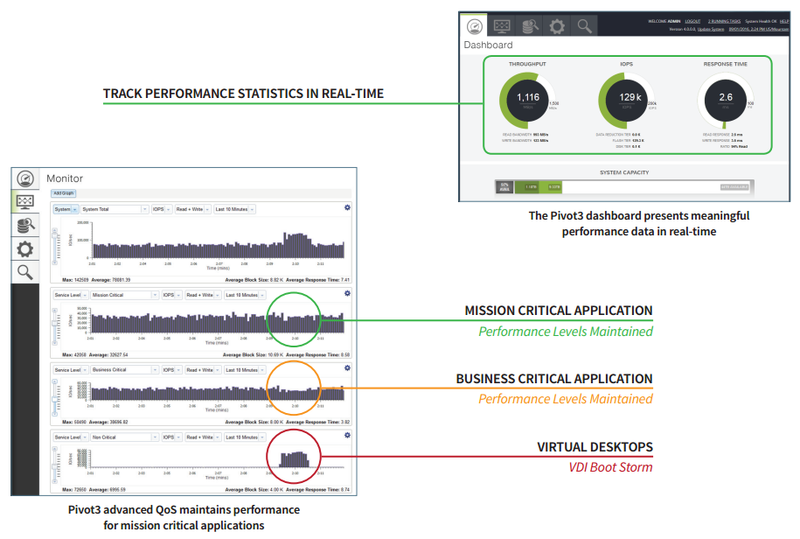 High I/O performance and low latency are key to a successful VDI user experience. Nothing stalls VDI adoption faster than user frustration causedby slow desktop boot-ups and application response time being slower than physical desktops. It is important to note that VDI is generally characterized as write heavy. While this is not a concern with all-flash storage arrays, since all reads and writes go to flash, it can be for hybrid arrays, that do not use flash for writes. Virtual desktop users will expect the same, if not better, user experience as they have with their physical desktops. For a storage system, this means that performance must remain consistent, even during boot storm, virus scans, and other updates. If virtual desktops are hosted on the same storage system as other applications, resource contention must not affect user experience. Having documentation that the storage is validated with your VDI platform of choice and what results should be expected takes risks and unknowns out of the VDI deployment. Overall storage solution cost (upfront hardware and software plus on-going administration, support and maintenance) can put the VDI project out of reach, especially if the storage can only handle the VDI workload. The higher the user count or applications the system can predictably support the lower the cost per desktop. Confidence that your storage system can scale to meet VDI demands is reassuring. Being able to scale performance and capacity independently allows your storage system to grow in the dimension needed without having to incur unnecessary costs. Furthermore, the ability to scale performance without swapping out controllers or needing to add flash as capacity is scaled makes scaling less cumbersome and less costly. The ability to run VDI alongside other applications would be a desirable capability for most companies, especially mid-sized or small-to-medium enterprises, since it reduces the costs and management complexity associated with storage sprawl across the organization. VDI workloads can be very write-heavy. Pivot3 N5 fash arrays (both all-flash and hybrid) utilize a PCIe flash-first data path, where every write request is serviced by ultra-low latency PCIe flash resulting in faster response times for desktop users. QoS Unlike other storage arrays that treat all desktops the same, Pivot3’s policybased advanced Quality of Service (QoS) governs performance targets, I/O prioritization and data placement, allowing SLAs to be established and met for based on category of desktop users. Pivot3 N5 flash arrays deliver the predictable desktop performance end-users require combined with industry-leading flash utilization. Pivot3 N5 flash arrays were architected to maximize both performance and capacity at a reasonable cost. Flash is integrated into the CPU bus via PCIe, it runs at microsecond speeds with no need to traverse a RAID controller in the case of the hybrids. PCIe flash is combined with high performance capacity SSDs in the all-flash array for the right combination of high endurance, low latency and capacity. PCIe flash also consumes zero drive bays; no capacity is sacrificed for performance. The Pivot3 N5 hybrid arrays allow you to scale performance online by adding more PCIe flash into the system, doubling system performance, without consuming drive bays. If more capacity is required, up to three drive shelves can be added to every Pivot3 N5 hybrid or all-flash array. Additionally, Pivot3 allows you to scale performance to the host, via server-side read cache, to address ultra-low latency needs. Storage arrays are often dedicated to VDI workloads to prevent resource contention with other applications. 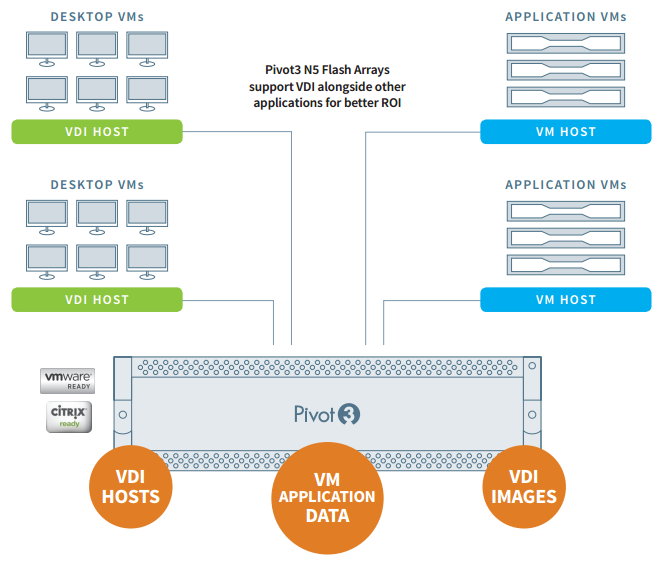 With PCIe flash-first performance and QoS policies, Pivot3 allows you to confidently support multiple applications, while isolating VDI workloads from other applications. This eliminates contention, while reducing storage sprawl and administration and maintenance costs. Pivot3 N5 flash arrays are validated with the Citrix VDI Capacity Program for XenDesktop, and the VMware Horizon Fast Track Reference Architecture and Proven Storage programs. White papers, reference architectures, and case studies of Pivot3 N5 flash arrays deployed with Citrix XenDesktop and VMware Horizon View are available. The Pivot3 N5 is available in multiple performance and capacity configurations, each integrated with PCIe flash for low latency performance and SSDs or HDDs for capacity. They are capable of supporting hundreds to thousands of virtual desktops per N5 flash array. The Pivot3 N5 feature-set combines best in class performance along with patented Dynamic Quality of Service and simplified management providing a cost effective storage foundation for your VDI infrastructure.